One of the highest priorities for the St. Francis Sailing Foundation is to support American sailors who strive to represent the USA in the Olympic Games, and hopefully earn a medal. The 2016 Olympic Games are now less than 2 years away, so competitors are pushing very hard to place high in international regattas and earn their country an invitation for each sailing class in the Rio Games. The Miami ISAF World Cup event is the first really big event on the 2015 schedule. It has a long history of attracting the best sailors from all over the world to compete in variable conditions in wonderful Miami weather. Unfortunately, in recent years the weather is “too good” and racing has been very limited due to light wind. This year’s Miami event was one of the best ever. More than 700 competitors were put to the test. The event started with 20-30 knot survival conditions and then progressively mellowed during the week. Overall, the Americans had some bright spots and some disappointments. Unfortunately there were no podium finishes. In a number of classes, the American team has not yet qualified for a spot in the Olympics, so further progress is needed at this summer’s World and Continental Championship events when more Olympic berths will be awarded. Paige Railey came back from a serious bicycle accident last year. After a long period of rehabilitation, she showed that she is ready to again sail at the highest level. Throughout the event he sailed consistently in the top ten and then won the double point medal race. This brought her up to 4th place overall, just eight points out of the silver medal position. Christine Neville qualified for the gold fleet and finished 38th overall. Many think that Paige, a former Rolex World Sailor of the Year, is the best American hope for a medal in the Rio Olympics. The Brit, Giles Scott trounced the fleet. Caleb Paine qualified for the medal race, and finished 9th overall. After the San Francisco-like conditions on day one, Marion Lepert led the fleet with finishes of 1 and 4. However as the week progressed, she learned just how competitive this international fleet is in light and moderate air, leading to a16th overall finish. Farrah Hall, the 2012 US Olympic representative, had the opposite scoring trajectory. She moved up to 18th overall, but 36 points behind Marion. Overall, the 49er fleet was remarkably competitive. Out of 13 scored races, the gold medal Danish team never won a race. And after all those races, 4th was separated from 10th by just 17 points. The dominant American team, Brad Funk and Trevor Burd has been steadily improving and moved up to 7th in this event, finishing second in the medal race. The StFSF has supported a number of young teams some of which were cutting their teeth in their first international regatta. And are really pointing towards the 2020 games. 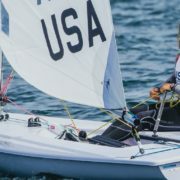 The Bay Area team of David Liebenberg and Dan Morris, in their first international competition, surprised many by having some top 5 finishes, thereby making the gold fleet, and finishing 14th overall. The Strammer-Kushner team also made the gold fleet and finished 27th overall. Other StFSF supported teams sailed in silver with the following overall finishes: Barrows-Joe Morris 38th, Wilson-McBride 47th, and Ryan-Hans Henken 53rd. StFSF-supported Paris Henken and Helen Scutt finished 29th overall while Debbie Capozzi and Molly Vandemoer finished 31st. StFSF-supported Michael Easton and Katherine Pettibone just came together as a team and finished 21st, the top American score. John Casey and Kristen Lane finished 38th. This year’s “Night With the Stars” takes place on St. Patrick’s Day! 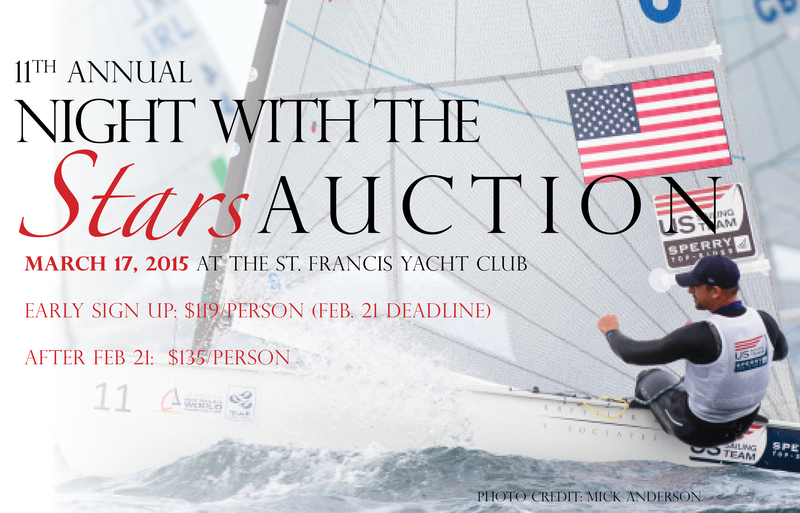 With a little luck of the Irish, it is sure to be a win-win for both bidders and grantees of the St. Francis Sailing Foundation. An impressive array of auction items are on tap to support aspiring Olympians, community sailing programs and competitive sailing Programs. The auction brochure, which can be viewed in early March, has full item descriptions – but here’s a sneak peek! Luck of the Irish Could Color Fortunes Green for the St. Francis Sailing Foundation’s 11th Annual Night with the Stars! One Week Gourmet Inclusive at Casa Vela Beachfront Treehouse – Playa del Carmen, Mexico. Casa Vela is a 4 bedroom beachfront estate complete with a plunge pool, kayaks and paddleboards, managed on a “gourmet inclusive” plan: airport transportation, daily maid service, full-time overnight security guard, and a gourmet chef who will prepare three meals daily – everything included for up to ten guests. Concierge is on duty to plan massages, fishing and snorkeling trips, and chauffeured excursions to the ruins – winning bidder just pays for these extras, any alcoholic beverages, and airline fees. May slice the mile awards as needed between business or coach. Work with Chef Antonio to create a menu item, in your name, to be added to the Grill Room Menu for 2015. Kick off this exclusive experience with a private dinner for eight in the main dining room. Chef Antonio will hand select the wines to be poured for your group. This is the ultimate dinner party experience! Own a piece of StFYC History! Our Staff Commodores have hand selected and signed beautiful wines from their private collections for you to enjoy. Stock up your very own 12 bottle wine locker located in the StFYC Main Dining Room that is yours, with no corkage fees, for one year, and take the rest of the bottles home in the 50 bottle wine refrigerator included in this package. As a special bonus, you will receive a one-year membership in the StFYC wine society! The 1 bedroom Cristal Suite is located in the most coveted neighborhood in all of Paris, the Faubourg St Germain area of the Left Bank, the northeastern portion of the 7th arrondissement on the edge of the 6th. Walk to Notre Dame, Île Saint-Louis, Musée d’Orsay & more! Then, head south for a two-night stay (including breakfast) for 2 people in the newly launched Yacht Club de Monaco cabins – an opportunity rarely offered outside of this exclusive club’s membership. Skipper the Commodore’s Knarr, Svenkist, with Sean Svendsen, Paul Cayard & John Kostecki as Crew! Join a Wednesday Night Series Race and take the helm with an all-star crew including Commodore Svendsen, John Kostecki & Paul Cayard. You will have on the water, commemorative photos by Chris Ray to document this experience. Following the race, join the Wednesday Evening Series Party for post-regatta cocktails and buffet dinner. Just think, when is the next time you will see Commodore Svendsen on the bow as you call for a jibe? Enjoy all 5 Rooms of the Tinsley Lighthouse during the weekend of June 12 – 14. You will have full control of the Lighthouse and a hosted dinner on Saturday night for you and your guests with scrumptious fare and robust wine. Family reunion? Gathering of friends? Either way, you are sure to share memories for a lifetime. Couples Cruise to Tinsley Island for 2 adults, 4th of July Family Cruise to Tinsley for 2 adults & 3 children, Women’s Cruise to Tinsley for 1 adult, Stag Cruise to Tinsley for 1 adult, Labor Day Cruise to Tinsley for 2 adults & 3 children, Commodore’s Ball at the Clubhouse for 2 adults, Member’s Christmas Party at the Clubhouse for 2 adults, and New Year’s Eve at the Clubhouse for 2 adults. Get behind the scenes with the USA entry in this year’s race around the world. Join Skipper Charlie Enright and the team during the Newport, RI stopover May 15 for a Meet and Greet, Boat Tour, and Team Gear package. Visit stfsf.org to view the auction brochure for more details and to start planning your bids now! Please call the front desk or visit the StFYC website to make your reservation. The auction night is vital to ensure the continuity of the Foundation’s wide-ranging programs. Outreach programs continue to expand on the Bay, not only supporting aspiring Olympic athletes, but also introducing young people to the sport through grantees such as Call of the Sea and the Treasure Island Sailing Center (TISC). Grants have also provided scholarships to promising young sailors and supported the Cal Maritime Academy Sailing Program. The outreach component of the St. Francis Yacht Club High School Sailing program is putting many budding competitors on the water. The St. Francis Sailing Foundation grants money to deserving sailors and organizations that promote sailing, racing competition and maritime education. Founded in 1985, the Foundation is a charitable 501(c)(3) corporation. The Treasure Island Sailing Center‘s (TISC) mission is to improve the Bay Area community and the sport of sailing by providing access, facilities, and sailing instruction to people of all socioeconomic backgrounds, skill levels, and physical abilities. TISC offers sailing and water sports lessons to youth, adult, and adaptive sailors and provides scholarships to all who meet the financial requirements. A full service sailing center, TISC never turns away a child and has no limit on the number of scholarships it offers. In line with its mission to make sailing more accessible to all kids in the Bay Area, TISC has partnered with the Olympic Circle Sailing Club (OCSC) to put together a competitive high school sailing team at Envision Academy of Arts and Technology, a tuition-free charter high school in Oakland whose mission is to have their kids attend and finish a 4 year college degree. The Envision Academy Sailing Team (EAST) is wholly funded by TISC, OCSC and community support. EAST students had the opportunity to enroll in summer swim lessons and sailing camps at TISC to prepare for the Varsity Sailing Team that started last fall. They have weekly practices at TISC throughout the academic school year in the hopes that next year a competitive sailing team is born. TISC’s Set Sail Learn (SSL) program provides a learning opportunity to fourth graders in the San Francisco Unified School District by opening a door to the Bay and world of sailing. TISC provides students the opportunity to sail while learning about the beauty, history, and biology of the Bay. In 2014 alone, TISC introduced over 44 classes from 19 elementary schools to its Set Sail Learn (SSL) program. The TISC Adaptive Sailing Program strives to make sailing accessible to anybody with a desire to learn including those with physical and developmental disabilities. In partnership with the Marin Sailing School Program for the Blind, TISC offers sailing instruction for the visually impaired. Students learn to sail through the use of creative and adaptive methods in a hands-on, mainstream teaching environment. The objective is the same as for sighted sailors: to harness the wind and to experience all the challenges and rewards of sailing. Through the Adaptive Sailing Program, disabled sailors gain a sense of independence and self-confidence. In 2014, over 2,534 students went through the various TISC programs including 2,325 youth students, 119 adaptive students, 33 adult students and 57 watersports students. Almost 70-80% of the TISC students need and receive either half or full scholarships to participate in the programs. Donations by organization such as the St. Francis Sailing Foundation make these scholarships possible. For many years the St. Francis Sailing Foundation has donated substantial funding annually for scholarships, portions of which were matching funds that helped TISC solicit additional individual donations. To learn more about the Treasure Island Sailing Center please visit their website at tisailing.org and their Facebook page: Treasure Island Sailing Center. 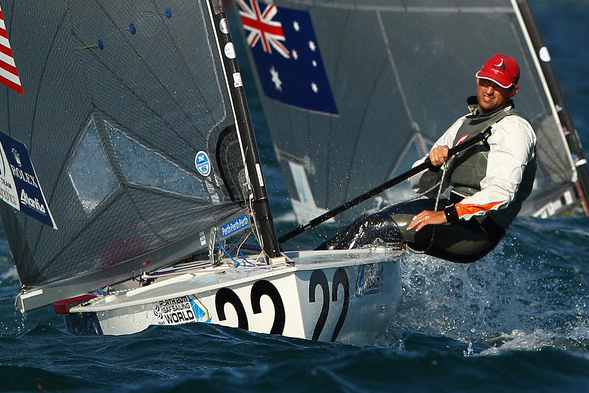 Finn sailor Caleb Paine is on fire! Currently ranked 1st in the country and 5th in the world, Caleb’s notable finishes this past year include 1st at Finn North Americans, 5th at Sailing World Cup Hyeres, 7th at ISAF Sailing World Championship in Santander and 3rd at the ISAF Sailing World Cup Final Abu Dhabi. At the ISAF World Cup in Miami last month, Caleb qualified for the medal race and placed 9th overall. Caleb attributes part of this success to his Foundation advisor Bill Kreysler and the St. Francis Sailing Foundation. Caleb has been sailing his entire life and started racing at the age of 7. After finishing high school, Caleb decided to put college on hold so he could pursue his lifelong dream of winning an Olympic gold medal. He bought a Finn sailing dinghy and began competing full time in 2009. In 2011, he was selected for the US Sailing Team Sperry Top-Sider and has since been climbing the world ranking in preparation toward his goal. The most challenging aspect of Caleb’s quest for an Olympic medal has been financial resources. It took him 5 years to get a new mast and boat made to his specifications. Last year, with Bill Kreysler’s help and financial assistance from the Foundation, Caleb has had more resources to refine his equipment and spend more time sailing in Rio de Janeiro and other parts of the world to hone his skills. It’s paying off: the results have been spectacular. “Rio is just around the corner and my current successes are largely due to the St. Francis Sailing Foundation and its members. I look forward to the new year to continue my progress and get closer to achieving my goal of Gold in Rio 2016,” Paine commented. To learn more about Caleb and his quest for the gold, visit his website at www.medalinrio.com and like his Facebook page, Caleb Paine Olympic Campaign. Welcome to the inaugural edition of the St. Francis Sailing Foundation newsletter. Thanks to the hard work of our volunteers and the overwhelming generosity of our many donors and supporters, the Foundation is expanding the grants and programs that support our mission of community outreach, development and support of Olympic and competitive sailors, and maritime education. We look forward to interacting with you via this newsletter to highlight the successes of our many grantees and programs. Greater year round communication is pivotal to attaining our goals, and this newsletter, which you will receive quarterly, is a way that we hope to improve, sustain and grow our mission into the future. If you did not receive this newsletter via email and wish to do so in the future, please sign up on our website at https://www.stfsf.org. For cost-savings purposes, our ultimate goal is distribution of the newsletter by email only. Johnny Heineken Named US Sailing’s 2012 Rolex Yachtsman of the Year! 2012 Rolex Yachtsman of the Year: Johnny Heineken (Larkspur, Calif.), age 24, has been named the 2012 Rolex Yachtsman of the Year for his dominating performances in competitive kiteboarding, including the Kiteboarding Course Racing World Championship in Cagliari, Italy, where he topped 148 competitors to claim the world title for a second consecutive year. Heineken also proved his racing prowess by besting 45 competitors in the Kiteboarding North American Course Racing Championship in San Francisco and 34 competitors at the Pacific Pilsner Canadian Kiteboard Course Racing Nationals in Squamish, Canada. He set a new course record (14 minutes, 4 seconds) in the Ronstan Bridge to Bridge Race in San Francisco among 58 entrants and rounded out his record by posting victories at PKRA Mexico (20 competitors), PKRA Burn Kiteboarding World Tour (16 competitors) and Copa Mexico Regatta (13 competitors). He finished second at La Ventana Classic (20 competitors) and took third at both the PKRA Beetle Kitesurf World Cup (31 competitors) and PKRA Gold Games Kitesurf (30 competitors). The selection panel was especially impressed by the fact that Heineken’s racing took him to venues across the globe – including Germany, France and Turkey—where his fellow kiteboarding competitors were considered the world’s best. They also made note that kiteboarding (also referred to as kitesurfing—an athletic surface water sport combining aspects of wakeboarding, windsurfing and surfing and using a large controllable kite to harness the power of the wind) had come into its own as a significant sailing genre. One panelist pointed out that the term “yachtsman,” despite its allusion to the most traditional aspects of sailing, easily befits a sailor with Heineken’s talents and devotion to growing the sport. Heineken, who was born in Greenbrae, Calif., trains and travels with his older sister, Erika Heineken, age 26, who was runner-up this year for the Rolex Yachtswoman of the Year and shared the top step on the podium with Johnny at the Kiteboarding Course Racing World Championship as the women’s division winner. Johnny Heineken has a degree in mechanical engineering and works on the mechanical team at Alameda-based Makani Power, an alternative energy company developing airborne wind turbine technology. He is a member of St. Francis Yacht Club, which he praises for helping pioneer course racing for kiteboarding. After four days, the Kiteboard Racing Word Championship concluded in the waters of the Poetto Beach. Erika Heineken, finishing just one point ahead of the 2011 champion Steph Bridge from Great Britain, has become the new female world champion. Johnny, younger brother of Erika, was confirmed world champion, followed by San Francisco bay area local Adam Koch and Frenchman Julien Kerneur. Portsmouth, R.I. (July 9, 2012) – Building upon its support of the 2012 US Olympic and Paralympic Sailing Program, the St. Francis Yacht Club becomes the first gold medal partner yacht club of the 2013-2016 Olympic cycle. The club’s generous donation of $100,000 to the program demonstrates its leadership in the sport of sailing and dedication to the Olympic movement. St. Francis YC has a long history of generously supporting the Olympic Sailing Program. The club has hosted several world and national Olympic class championships, and in 2000, it hosted the U.S. Olympic Sailing Trials. Leading up to the 2008 and 2012 Games, the club made a generous gift to the program, while providing individual assistance to individual Olympic hopefuls and members of US Sailing Team Sperry Top-Sider. 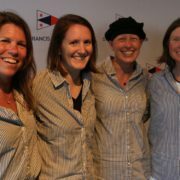 In 2008, the club hosted a farewell dinner for the U.S. Olympic Sailing Team before they headed to Qingdao, China, the venue of the 2008 Olympic and Paralympic Sailing competitions. The US Sailing Team Sperry Top-Sider is managed by the United States Sailing Association (US Sailing), the national governing body for the sport of sailing and sailboat racing. The top boats in each Olympic and Paralympic class are selected annually to be members of the US Sailing Team Sperry Top-Sider. US Sailing supports these elite athletes with funding, coaching and training. The title sponsor of the team is Sperry Top-Sider; other sponsors include Rolex Watch USA, Atlantis WeatherGear, LaserPerformance, Harken Team McLube, Bow Down Training, New England Ropes and Trinity Yachts.